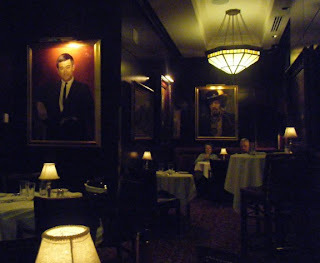 This is a fine, dry-aged steakhouse on par with the Met and El Gaucho, and with some pleasantly non-standard drinks. The infused (peach?) vodka was very pleasant and the Hemingway Daiquiri was delicious. This is part of a national chain but it's pleasantly localized by large paintings of various Seattle celebrities and business luminaries (we sat facing Jimi Hendrix and Bruce Lee in business attire). The prices are pretty standard for an upscale steakhouse -- $35 to $42 for the entrees you'll want (ala carte) -- and proportions of most steaks and sides are huge. Judging strictly as a bar, I still give El Gaucho a slight nod for the rat pack, romantic ambiance, but I'll prefer the Capital when I am looking for an interesting cocktail.